Canada is one of the only industrialized countries in the world that does not have a national securities regulator. Instead, it has a nationwide patchwork of thirteen securities commissions – one for each province and territory. The reason for this patchwork is Canada’s Constitutional division of powers between the federal and provincial governments. Because of their jurisdiction over property and civil rights and matters of a purely local nature, the provincial legislatures have the authority to legislate in respect of the securities trade within their respective borders. Despite more than 80 years of attempts to centralize and standardize Canadian securities regulation, all past proposals to create a national securities regulator have failed to pass constitutional muster. The most recent failed attempt was rejected as unconstitutional by a unanimous Supreme Court of Canada in 2011’s Reference re Securities Act. As a result of a decision released this week by the Supreme Court of Canada in Reference re Pan-Canadian Securities Regulation, that has all changed. In the most recent decision, the Court considered a cooperative proposal in which the federal government proposed a pan-Canadian securities regulation under the authority of a single regulator that provinces can choose to opt into by passing their own legislation to adopt the national regulations and national regulator. Several provincial / territorial authorities have already signed on to this national regulatory framework, in particular, Ontario, British Columbia, Saskatchewan, New Brunswick, Prince Edward Island and Yukon. Without getting into too many details of constitutional interpretation, the Supreme Court of Canada rejected the two objections put forward by the government of Quebec and the Quebec Court of Appeal in its decision below in opposition to the cooperative regulatory scheme: (1) that the scheme improperly delegated the provinces’ powers or infringed the sovereignty of provincial legislatures on matters within their property and civil rights jurisdiction; and (2) that the schedule exceeded the authority of the Parliament of Canada over the general branch of the trade and commerce power under subsection 91(2) of the Constitution Act, 1867. 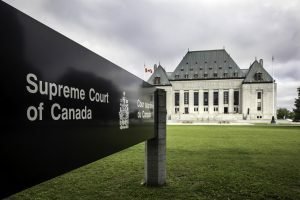 The Supreme Court of Canada rejected both arguments, finding that the provinces are free to adopt uniform legislation put forward by the federal government and also finding that the implementing legislation is intra vires the federal government’s trade and commerce power under subsection 91(2) of the Constitution. This decision is just the beginning. The process to create a (partially) national securities regulator and regulatory scheme is going to take time. Even then, it is unlikely that all Canadian provinces and territories are going to sign on to the national scheme – at least in the near future. However, this decision is a positive first step away from the inefficient and confusing patchwork of provincial and territorial securities regulators that has dogged Canadian securities regulation for generations.